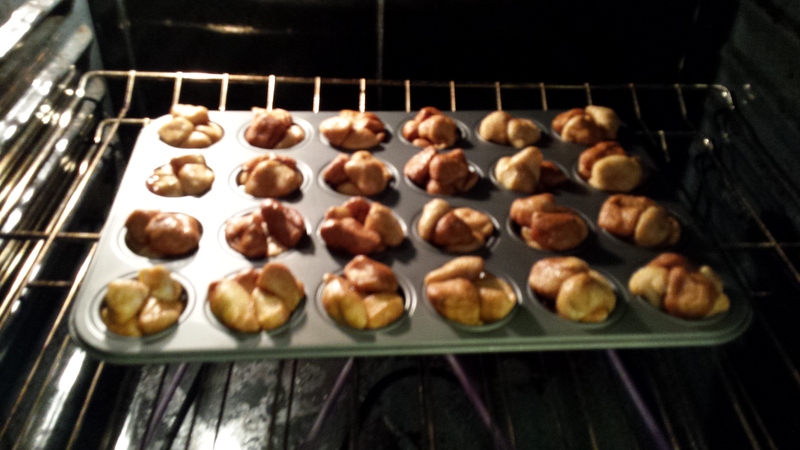 I have seen so many recipes for monkey bread over the years, and never made it. This past weekend I decided to make it for Sunday breakfast – a sweet treat to have with savory scrambled eggs with tomato and cream cheese. I wanted to make individual mini breads, and this was my first attempt. I would cut the biscuits into eighths instead of sixths for mini monkey breads; the muffin cups could barely contain them as they swelled and baked, and in fact a couple of pieces jumped over the side of the pan and onto the floor of the oven. Ouch! These were so tasty, and they kept jumping into my mouth throughout the day. I love the caramel that bubbled up and oozed over them. Fast and easy, delicious and satisfying. Can you ask for anything else from simple ingredients? I don’t think so! Spray a 24-cup muffin tin with non-stick spray. Combine the melted butter and dark brown sugar. Once the sugar fully absorbs the butter, spoon 1 1/2 teaspoons into each cup of the mini muffin tin. Combine granulated sugar and cinnamon in a gallon size zip top bag; add biscuit pieces. Toss to coat. If you’ve cut the biscuits into 6 pieces, put 5 pieces into each muffin cup. If you’ve cut them into 8 pieces, put 6 or 7 pieces into each muffin cup. Bake for 12 to 15 minutes or until golden brown. Cool in pan for 1 minute before turning out onto parchment lined sheet pan. Serve warm.